The fourth Alef Trust residential retreat from the 26th – 30th August 2017 was attended by alumni, students and faculty of the Master’s in Professional Development: Consciousness, Spirituality and Transpersonal Psychology, who ventured to explore the theme of “New paradigms in psychology and spiritual practice”. A circular oil lamp sits on a triangular base as the group gathers in the Solar Room of Quaker retreat centre Charney Manor in rural Oxfordshire. It is late summer and the sunshine streams in through the windows. Names, faces and voices of colleagues and faculty leap beyond the online infrastructure of webinars and forums, including Shamanistic Psychology tutor Steven Schmitz from California and Course Directors Jessica Bockler and Les Lancaster. Les lights the lamp and the first sacred space is created. Facilitating this residential is both challenging and extremely interesting, Jessica shares. There are so many elements to bring together and balance; expectations and possibilities woven along threads of shared intention. 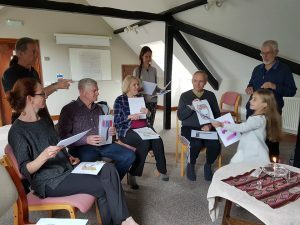 As an online learning community, the opportunity for face-to-face connection is deeply appreciated, as is the chance to play together with embodied games and rituals, share practices and socialise through informal chats and walks in nature. The presence and participation of Jessica and Les’ brilliant seven year old daughter Amelia also adds to the warmth, joy and sense of community. The venue itself is a charming English country house with well-kept gardens, comfortable rooms and delicious vegetarian meals. Each day begins by coming together for a meditation. This includs a non-dual Advaita experience guided by John, a Shamanic prayer circle under the morning sky with Steven and a video of spiritual teacher Mooji’s satsang, sharing dialogue on male-female relationship dynamics followed by silent reflection facilitated by Ruth. A key aspect of the new paradigm which lies at the core of our collective inquiry during these days is the relevance and impact of embodied work. Yoga stretches the body, focuses the mind and touches the spirit through gentle and profoundly moving sessions with Lorraine, who facilitates yoga for inmates in Mexican prisons, and Kundalini yoga with Francesca. We move on to Ensemble work with Jessica, who draws on her vast experience of theatre, combined with martial arts, to awaken our collective consciousness through activities involving spatial awareness, training with wooden sticks and movement games. Concentration, group awareness and flexibility prove essential for the laido inspired kata exercises, a Japanese martial arts tradition originally practiced with swords. Moving individually through the studio space whilst balancing our group’s distribution gives a powerful sense of self and other, of freedom and discipline, two themes that weave their way into our discussions. However, we also recognise that there are moments when it becomes difficult to articulate the sensations evoked through experiential work, which are perhaps glimpses of the sacred. Our afternoon sessions with more academic discussion pick up on the question of approaching the sacred mystery of the unknown. “I don’t know if I can articulate it accurately – I know it when I feel it,” observes Les, adding that it instils a sense of awe or reverence in relation to something larger than oneself. New research methods of transpersonal psychology, such as intuitive inquiry developed by Rosemarie Anderson, allow us to approach recognised qualities of human experience that can’t be seen, touched and measured, which conventional science tends not to acknowledge. This paradigm shift also embraces research as an encounter with the sacred, engaging all of the being (including emotional, intuitive and other non-rational dimensions of self), and a conscious awareness of the involvement of the unconscious (or not conscious). Transpersonal research can be transformational for both the researcher and participants. It has been suggested that this in itself gives validity to the method, as well as the rigour and discipline applied during the process. There is sometimes a paradox between the sacred history and literal history of wisdom traditions which grow and develop using the knowledge, language and cultural metaphors of their day. 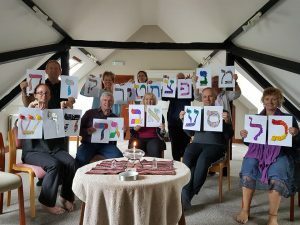 Les gives fascinating insights into the connection between the Hebrew alphabet and the meaning and purpose of the Kabbalah. He explains the sacred history of Moses who understood how to align with the forces of creation. This hidden reality was originally contained in temples which expressed their inner truth in ways such as its proportions. However, temples can be destroyed and so the sacred was put into language; into these 22 letters which cannot be destroyed. Each letter contains a constellation of meanings and Kabbalistic scholars throughout the ages have reached towards increasingly more subtle levels of understanding. Les and his colleagues are bringing this heavily intellectual work into the new paradigm through active embodiment. During the retreat he shares the movements and some meanings associated with each letter which we also practice. The alef, first letter; silence behind creation, seed of reflexivity, a state of balanced potential. Its movement begins with a focus on the breath as it passes through a figure of eight, bringing the breath back to the heart as the left hand is cupped at the heart centre and the right arm is raised. Bet, second letter. We turn away from the nothing, feeling this behind us as the hands expand to the edge of our peripheral vision and suddenly move forward in an act of directed conscious manifestation. Each letter is expressed through a language of movement and sensation, giving us a taste of the repertoire of spiritual faculties that flow through this powerful work. Discussion sessions follow and allow an interesting exchange of experiences and inquiry. Steven’s guideline of not taking ordinary consciousness into non-ordinary reality presents its challenges. Were we really journeying into a spirit realm or ‘just’ engaging with active imagination? What is the imagination? What is this border realm between psyche, soma and spirit? If useful and potentially transformative information is received, does its ontological status even matter? A sense of transpersonal psychology’s significance in bringing psychology to the discussion about the sacred and learning from wisdom traditions is powerfully felt. Further discussion contrasts Shamanism and the contemporary non-dualism of Advaita, with graduate students Ruth and John reflecting on the liberation from suffering caused by seeking. The nature of mind is to ask, but when the mind drops and accepts that “this is all there is” there is an experience of oneness, they explain. Marielle shares its correlations with teachings from the school of Spiritism which she first encountered in her native Brazil, and other participants offer different points of view. As the residential draws to a close, there is a sense that a collective ritual would be a useful way to integrate and celebrate the experiences. 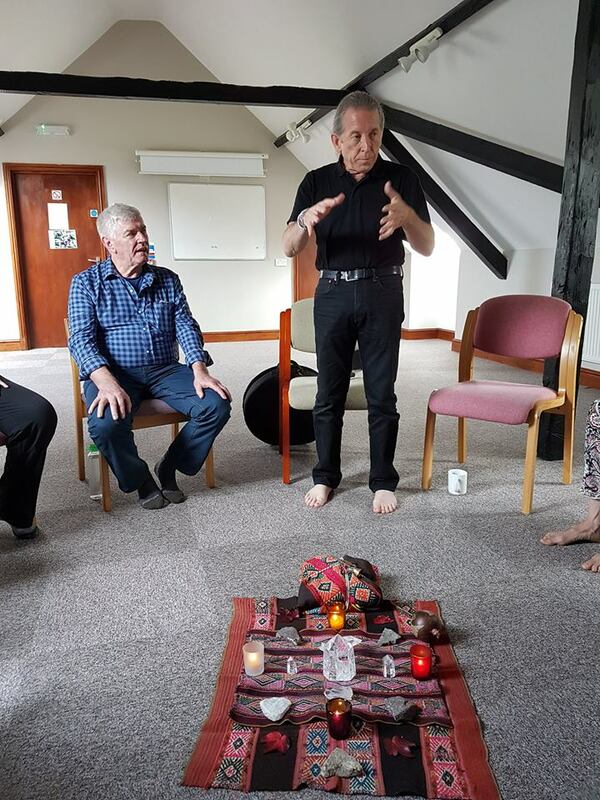 A brainstorming session brings together many of the elements: Kabbalah and Shamanism, drumming and active movement through the space, embodied exploration of the masculine and feminine, vocal soaring and silence. We end standing in a circle around the oil lamp, holding hands. Once the last person had turned away, facing outwards towards the wider world, the lamp is extinguished and the sacred space is closed. At our back, the silence behind creation, seed of reflexivity, a state of balanced potential. 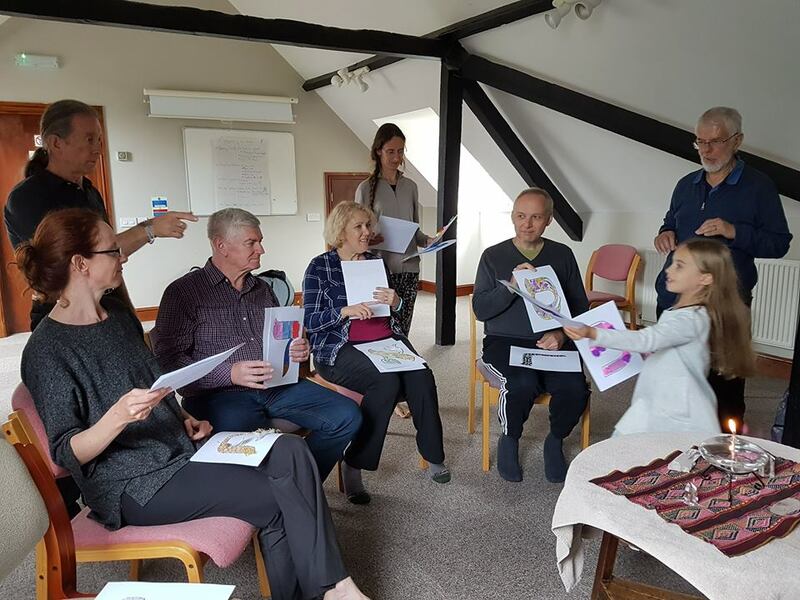 “It was a fantastic time of deep transpersonal connection – I feel so grateful to everyone who made it possible. It’s amazing to have an academic home that is also a spiritual home” affirms Lorraine. On behalf of all the participants we would like to extend a massive thank you to Les and Jessica, and to everyone involved with the Alef Trust for making this annual retreat possible. May we continue to connect, create and share our transpersonal journeys with each other, our communities and the world.